You can search for a patient from the Patient Search box to access that patient's record. The Patient Search box is available at all times next to the Patient menu. Click (or tap) in the Patient Search box. Start typing a patient's first name, last name, chart number, or phone number (at least the first four digits). Continue typing as needed to narrow the search results list. "New" indicates that the patient is a new patient, and his or her patient record may contain only minimal information currently. Scheduling an appointment for a new patient creates a patient record with a New status for that patient. If the patient you are searching for does not appear in the results list, you can click (or tap) Create New Patient to add a record for that patient or click (or tap) Create New Household to add records for that patient and members of the same household. If you work in a multi-site organization, a matching patient will appear in the results list if that patient's preferred location is in a location to which your user account has access unless you use the advanced search functionality. 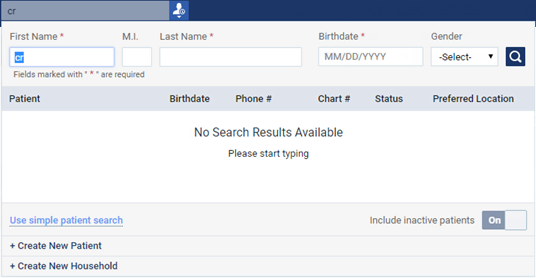 If you work in a multi-site organization with a large database of patients, the advanced search feature is available to help you locate a patient when the simple patient search returns a lot of results that match your search criteria. Click (or tap) the Use advanced patient search link. Type all or part of the patient's first and last name and his or her birth date, and optionally select a gender. Then, click (or tap) the Search button . Note: The advanced search always includes inactive patients. Click (or tap) a patient name. Note: The selected patient's name appears in the Patient Search box for your reference in case you want to hide the Patient Information ribbon. To show the Patient Information ribbon after it has been hidden, click (or tap) the down arrow button below the Patient Search box. To hide the Patient Information ribbon, click (or tap) the up arrow button below the Patient Search box. You are also able to search for patients using the patients phone number in the search field. Simply enter in the first four digits and the search list will populate.